One of the new buses are the NICE buses. 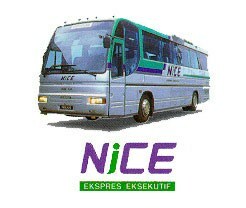 The Nationwide Interstate Coach Executive [also known as NiCE ] covers daily trips from Kuala Lumpur to Singapore and Kuala Lumpur to Penang (single and return trips). The fare from Penang to Kuala Lumpur is RM50,- (children RM35,-) in super luxury coach. The bus is air-conditioned with plenty of leg space and accommodates only 22 passengers. A snack of fried rice and coffee/tea is served on the way. There are newspapers and you can get pillow and blanket. TV and video are for your viewing pleasure. The terminal in Penang is at the Garden Inn in Anson Road, opposite KDU college (Kolej Damansara Utama and it is a private college that prepares students for entry to overseas universities). The Kuala Lumpur terminal is at the old Railway Station (See: Highlight of KL ). That's near the National Mosque. Traveling time from Penang to Kuala Lumpur is about 4 and a half hours. The "ticketing office " in the Garden Inn (hotel) on Penang.